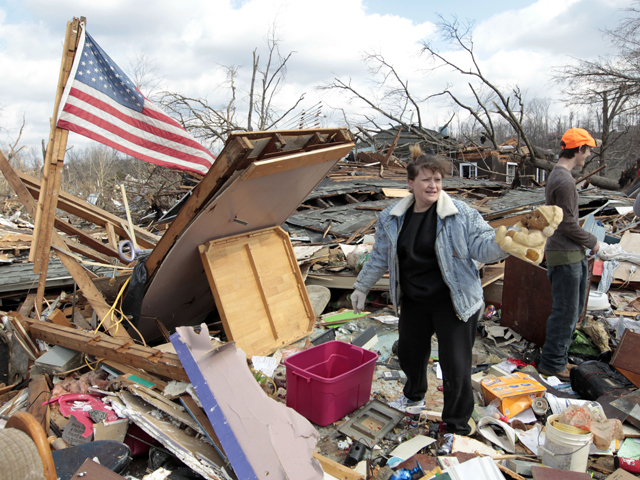 (CBS/AP) WEST LIBERTY, Ky. - Across the South and Midwest, survivors emerged Saturday to find blue sky and splinters where homes once stood, cars flung into buildings and communications crippled after dozens of tornadoes chainsawed through a region of millions, leveling small towns along the way. The worst damage appeared centered in the small towns of southern Indiana and eastern Kentucky's Appalachian foothills. No building was untouched and few were recognizable in West Liberty, Ky., about 90 miles from Lexington, where two white police cruisers were picked up and tossed into City Hall. In East Bernstadt, two hours to the southwest, Carol Rhodes clutched four VHS tapes she'd found in debris of her former home as she sobbed under a bright sun Saturday. "It was like whoo, that was it," said Rhodes, 63, who took refuge with four family members in a basement bedroom that she had just refinished for a grandchild. "Honey, I felt the wind and I said, `Oh my God,' and then it (the house) was gone. I looked up and I could see the sky." Friday's violent storms touched down in at least a dozen states from Georgia to Illinois, killing 19 people in Kentucky, 14 in Indiana, three in Ohio, and one each in Alabama and Georgia. The National Weather Service said the four twisters to hit Kentucky were the worst in the region in 24 years. In Indiana, an EF-4 tornado  the second-highest on the Fujita scale that measures tornadic force  packing 175 mph winds hit the town of Henryville, and stayed on the ground for more than 50 miles. In Indiana, a toddler was found alone in a field near her family's home after a tornado hit in New Pekin. Authorities learned Saturday she is the sole survivor of her immediate family, said Cis Gruebbel, a spokeswoman for Kosair Children's Hospital in Louisville, Ky. The girl's mother, father, 2-month-old sister and 2-year-old brother all died Friday, Washington County Coroner Rondale Brishaber said.She is in critical condition with extended family members at the hospital, and authorities are still trying to figure out how she ended up in the field. About 20 miles east, a twister demolished Henryville, Ind., the birthplace of Kentucky Fried Chicken founder "Colonel" Harland Sanders. The second story of the elementary school was torn off, one of the city's three schools lost to weather; the punishing winds blew out the windows and gutted the Henryville Community Presbyterian Church. Indianapolis Colts owner Jim Irsay has promised $50,000 to the relief efforts for tornado victims in southern Indiana. The Colts announced Irsay's pledge on Saturday. They also asked others to help in any way they can. "This half is gone and that half is damaged," said village native Steve Newberry, who was permitted into town Saturday to pick up medical supplies for his mother. She ran to the basement and tried to pull the door shut, but she couldn't. She heard a ripping sound as the ceiling peeled off and wind wrenched the doorknob from her hand. "I looked up and I could see the sky," she said. "I realized if I had stayed on the bed two seconds longer, I would have been sucked out or crushed." Gene Lewellyn, his son and his son's 7-year-old daughter saw the tornado come over the hill, rushed to the basement of his one-story brick home and covered themselves with a carpet. "Right now, we are not sure what we are going to do," he said. "We all get out what we can get out." To locate a shelter, contact your local emergency officials; visit www.redcross.org; or call 1-800-REDCROSS (1-800-733-2767). iPhone users can download a free Red Cross shelter view app from the app store.